I've been feeling fat for days, noticing how my stomach was stretching against my jeans in new and unexciting ways, resolving to eat healthy, but then finding myself at the vending machine almost every day last week. I eat when I'm stressed. I eat when I'm anxious. And I eat when I'm bored. My working environment does not lend itself to supporting healthy eating habits, and it's taken a toll on my mental and physical health. Not that I don't take responsibility for walking myself to the vending machine, because I do. Today, I bought a new scale. The girl who I sublet this place from had left behind a scale and I had been using that for the last three months. I had been pleasantly surprised at first that the scale appeared to show that I weighed about what I'm supposed to at a healthy weight, 130 lbs. Really, just between me and you, I prefer to weight 126 or 128. When I'm 126 without muscle, it's a little too skinny, but 128 is perfect. Anyway, back in December the scale was showing around 130 lbs and I was elated because I thought it was impressive how my weight was staying the same even though I had been drinking like a fish, snacking on chocolate, and not going to the gym. I thought my body was doing an excellent job metabolizing all my stress induced excesses. During the last month, my habits have continued to be bad. I've gone to the gym a handful of times, I've eaten healthy a few days, but for the most part, I've been living an unhealthy lifestyle. Not enough sleep, too much chocolate, pasta, and dinners at my desk, and hardly any exercise. Yet, the scale continued to register 130 lbs. 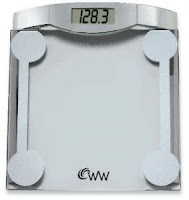 After this week of candy bars, I finally was suspicious enough to purchase a new scale. It's a sleek see-through glass model that also measures my body weight index. Do you know how much it said that I way? 134.6 pounds. And that was after just going to the bathroom. I now have definitive proof that I've put on at least 5 pounds in the last three months. This is not good. Not good at all. And, I know it's because of everything, but I'm tired of blaming things on everything. Things are changing, I'm happy about my new job, I should be back to being healthy. But, instead, I'm filled with anxiety. I'm worried about when my conflicts check with go through. I'm stressed about when I'll be able to give notice. I'm worried about the timing of my vacation and whether Bean is going to give birth right in the middle of the time I'm taking off. I want a break, but I want to be there for her and my nephew. I don't want to disappoint anyone, but I'm so burnt out I need a break. I'm not relaxed, I'm not coasting... I'm on edge. And, now, I also feel fat. I hate that. I want to be tight and lean. I want to be strong. I don't want junk in my trunk and I do not want to jiggle. I most certainly do not want cellulite. I like it when I don't have extra layers on my body. I always feel the most put together during those times. I'd give my left leg to weigh 130. In fact, I'd have to probably. Lass - I probably should not have even said any numbers b/c it's not about those. It's about how I feel, how my clothes fit, what I'm putting in my body, what I'm not putting in my body, the lack of muscle definition, the lack of any muscles... You know what I mean. Weight is relative. I just want to be where I'm feeling healthy and good, and right now I'm not in that place so it's frustrating. (p.s. You work out all the time, and you do gym classes I only dream about going to. You're training for a marathon! I am sure you are in absolutely wonderful shape). Buttercup, only when the stress is gone will you be able to feel better. I thought the conflict scenario was just a formality...right? You can still indulge in most foods, just cut down on the sugar, pasta, bread, and potatoes...will make an amazing difference. Oh, I know how you feel. I don't really have big weight problems, yet whenever I stop caring and gorge on too much chocolate (preferably Marabou...) for a while, I get that flabby, horrid feeling. And it's like a vicious circle, the crappier I feel the worse I take care of myself. It's so hard to break the cycle. I too bought a flash scale last year and it tells everything, like fat percentage and metabolic age and water levels. It's a huge motivator. In all honesty I got quite obsessed with it, but it was much better than obsessing about mini eggs. I hope you will find your new toy equally motivating. Get focused and you'll be 128 in no time. And you'll feel like a million bucks. Ps. I'm pretty hooked on low GL eating. The flab just melts away. Honestly. Gravelly - I know you speak the truth but sometimes it's hard to put into practice! Waspgoddess - I used to be so good about low GL eating. I need to get back in to it. Any ideas as to how to jumpstart my efforts? I'm with you on the love of Marabou, and glad to hear I'm not the only one who goes around in circles sometimes. It is indeed frustrating to know that your scale keeps on showing the same number when in fact, you already gained weight. Stress and other factors are just obstacles we need to overcome to have a healthy life. Thanks Pat! I'm working on eliminating the stress. Martha Stewart recently cited stress as a chief cause of wrinkles, and it causes weight retention around your middle. What more incentive do I need to get rid of it? 130 is bad? Your name is not Anna Kournikova right? Sparky - Snap out of it man! I'm sure you'll get over it. It's not good if you rush things. Everything we do needs time. Patience and sacrifice may be the answer.